During the 1970s Australian fork revival, three of the most significant and trend setting bands were Mulga Bill’s Bicycle Band, Cobbers and SteamShuttle. Appearing at various pop and cultural festival gave them exposure to wider audiences and set the direction of wider audience and set the direction of many contemporary and later groups. Hear founding members John Armstrong [Cobbers] , Barry Golding [MBBB]and Graham Seal [SteamShuttle] with NLA folklorist Rob Willis in music and conversation on their roles in the evolution of Australian folk music and what they are doing now. Barry Golding penned these notes in April 2016 after discussion with several former band members: Chris Bettle, Elizabeth Eager and Clive Willman (in April 2016 Barry was living in Kingston 3364 Victoria; Chris was living in Canberra, and Elizabeth and Clive were living in Castlemaine). We intend to progressively add other material, if there is interest and time. All of the band’s documentary records and original sound recordings are pre-internet and pre-digital, so this will take some time and effort. Mulga Bill’s Bicycle Band was perhaps the earliest, large full time, Australian ‘folk revival’ band. 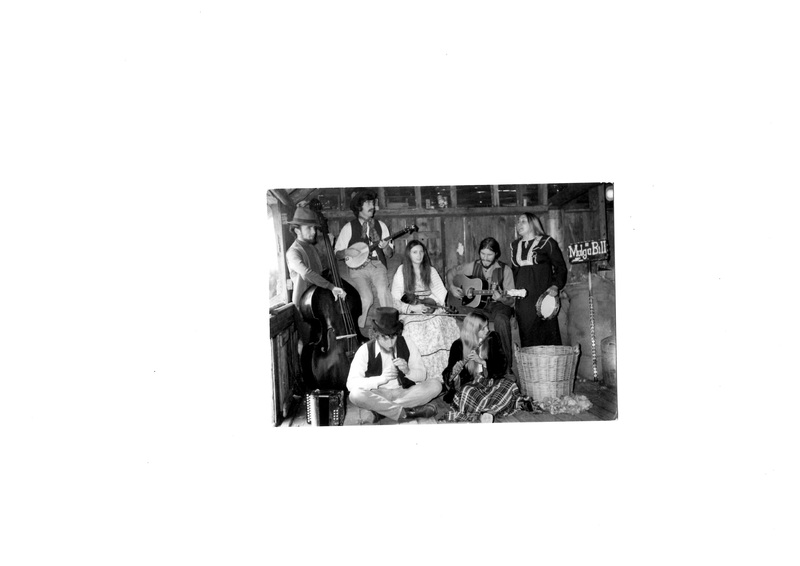 It began in 1970 as an offshoot of The University of Melbourne Folk Club and played first as a nine-person group in Swan Hill, Victoria in August 1970. Most members of the initial band were at that time students at the university. 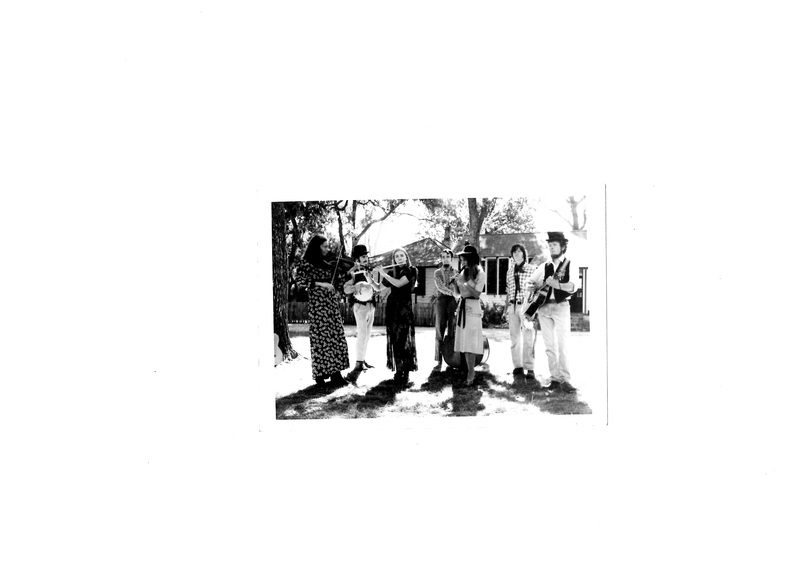 Mulga Bill’S Bicycle Band early line up, approx 1971: from left Elizabeth Vincent (violin); Tony Britz (banjo); Liz eager (flute); Ian Sullivan (double bass); Wendy de Veer (recorder); Barry Golding (percussion); Peter Mcdonald (guitar). Photo at Governor La Trobe Cottage, Melbourne. Over the full course of the band’s operation between 1970 and 1978, a total 20 members were at some stage part of the band. Only three original members: Tony Britz, Liz Eager and Barry Golding were there at the start and also at the end. The hand drawn spreadsheet below (made in 1986 by Barry Golding as part of a ‘Mulga Bill reunion’ in Daylesford, Victoria in 1986) summarises who was in Mulga Bill’s Bicycle Band between the first random gig (as a nine piece band in Swan Hill in 1970) to there end of the full time seven person band in mid 1975. It also includes those involved in the three radio programs recorded in the ABC Melbourne studios by the previous band members in 1976 (joined by Brian Gamble on drums). Three core members of the original band, Tony Britz, Barry Golding and Liz Eager teamed up with the Ballarat-based Jacaranda Jumbuks to briefly become the ‘Mulga Bill Jacaranda Jumbuk Combo’ in 1978, and from 1980 Everyman and his dog which played for many weekend dances and other functions across the region around and beyond Ballarat for almost two decades. Other former members of Mulga Bill’s Bicycle Band teamed up to play with others in different combinations, but that’s a story for another day. 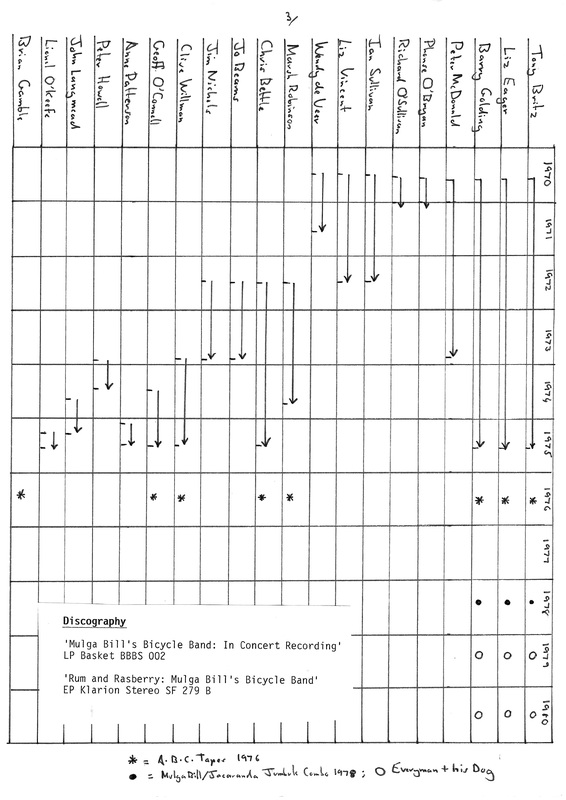 Spreadsheet of Mulga Bill’s Bicycle Band members, 1970-1975. For the first two years the band played part time, mostly in and around Melbourne, gradually increasing the frequency, with 19 gigs in 1971 and 92 gigs in 1972. The Polaris Inn in Nicholson Street, Carlton and functions at the Emu Bottom Homestead in Sunbury were amongst the regular gigs, but the band played at a wide range of other events in and around Melbourne including festivals, weddings, dances and concerts. By late 1972 several members were finishing their studies and four members: Tony Britz, Liz Eager, Barry Golding and Peter McDonald decided to commit to the band and commence playing and touring full time. Liz Vincent who had been playing violin and Ian Sullivan who had been playing double bass, in what had by then been reduced to a six person band, decided they could not fully commit. This necessitated recruiting a new fiddle player, Chris Bettle and a new bass player, Marsh Robinson. Jo Beams also joined around this as the band’s full time female vocalist and Jim Nichols joined as the band’s full time ‘roadie’. When Jo and Jim plus Peter McDonald left the band in late 1973 Clive Willman became the sound manager. Other members recruited to the band in 1974-5 included Peter Howell (double bass), Geoff O’Connell (electric bass and vocals), John Langmead and Lionel O’Keefe (guitar and vocals). The year after the band formally disbanded in July 1975 the ABC Music Department approached the band in 1976 to record sufficient studio-based material for three 45 minute radio programs. This was a final opportunity for the six members of the final band line up to record much previously unrecorded concert performance material as well as to develop some new material. In doing so they were joined by Marsh Robinson (this time on guitar) and Brian Gamble (on drums). These programs, narrated by Chris Bettle, Liz Eager and Barry Golding were digitally remastered many years later by Barry’s son, Karri Golding and distributed mainly to former band members as three set CD. All 33 items from the three programs (minus the narrative) are available for download. The band’s most active touring within Australia occurred in the three years between mid-1972 and mid 1975. Before 1973 most of the work involved one off gigs at a wide range of events including weddings, balls, festivals and hotels. The former Polaris Inn Hotel in Nicholson Street was a regular Friday night gig and the band did a lot of work for events at Emu Bottom in Sunbury. The band also appeared on HSV Channel 7 Penthouse Club as well at GTV 9’s Graham Kennedy Show. This was interspersed with television spots, which in the pre-internet era were critically important to get wider national exposure including playing at The “Bellbird Ball” as part of the ABC series Bellbird. Once the band went full time with eight members it was no longer able to make a living without extensive travel and touring, and they bought and fitted out a bus with 8 bunks and a kitchen to live and tour in. Much of the core work in 1973 involved intensive concert tours for State Arts Councils across the whole of Victoria, New South Wales, Tasmania and Queensland. In 1973 the Band took the bus to NSW and spent a memorable week at Nimbin during the 1973 Aquarius Festival. The half hour Australian TV documentary series Big Country featured the band during its 1973 Queensland tour (during which its LP record was also recorded). Being broadcast nationally Big Country brought the band exceptionally valuable publicity. The only overseas trip the band undertook was to play and represent Australia at the World Cup Soccer Final opening concert in Frankfurt, (West) Germany in June 1974. 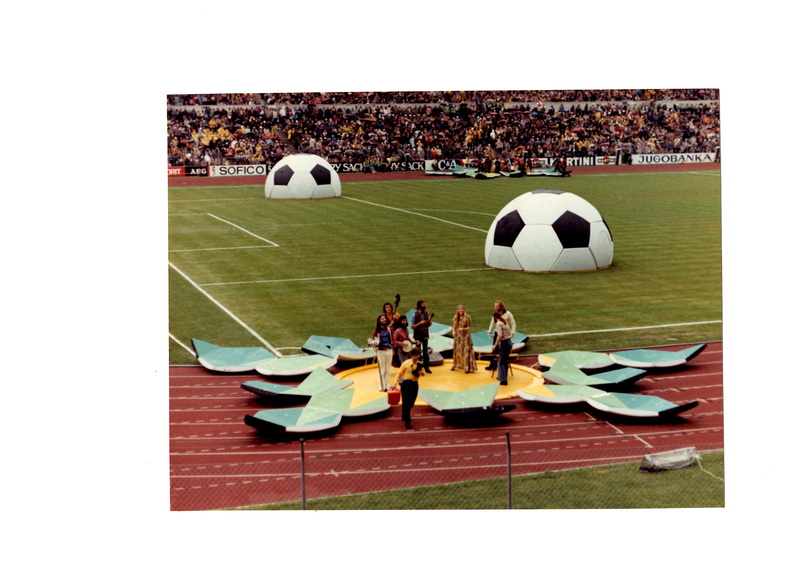 World Cup Opening Concert, Frankfurt, West Germany. Mulga Bill’s Bicycle Band was one of 16 national ‘folklore acts representing countries participating int the final. The band had just ‘burst’ out of a polystyrene soccer ball, from left to right Barry Golding (lagerphone), Peter Howell (double bass), Tony Britz (banjo), Chris Bettle (violin), Liz Eager (flute), Clive Willman (sound). The guard in the front was part of the elaborate security precautions in the wake of the 1972 massacre of athletes by Palestinian terrorists at the Munich Olympic Games. 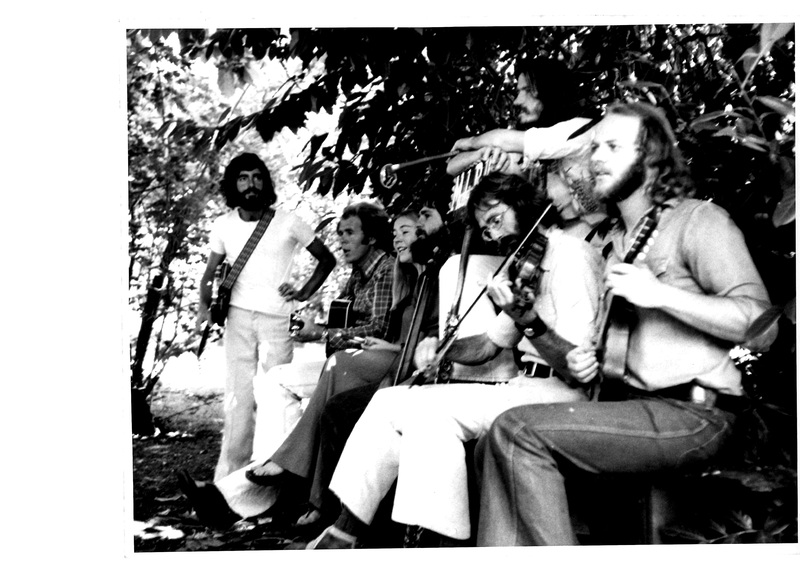 In 1974 the band completed two repeat Arts Council tours of NSW and Queensland, the latter lasting eight weeks and covering much of the huge state. The band also completed extensive self organised tours of other Australian states including the Northern Territory (with their bus in 1973), in Western Australia (February 1974). South Australia (March 1975) and NSW (June-July 1995). When back at base in Melbourne between tours the work was very intensive: mostly one off well paying gigs but also including regular bush dances at the Horticultural Hall. By the time the band members collectively decided to cease in July 1975 the band had played in hundreds of towns and venues in the four eastern Australian states and was very well known. The only state where touring was limited was Western Australia. 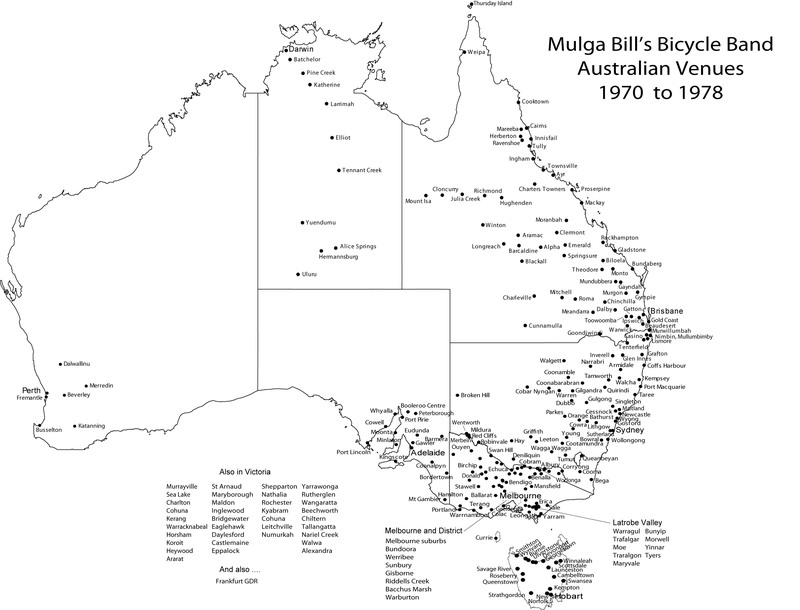 A map showing where the Mulga Bill’s Bicycle played across Australia between 1972 and 1978, below, gives some indication of the venues played, many of which were revisited. Credit for the original map to Clive Willman. The band produced two records. 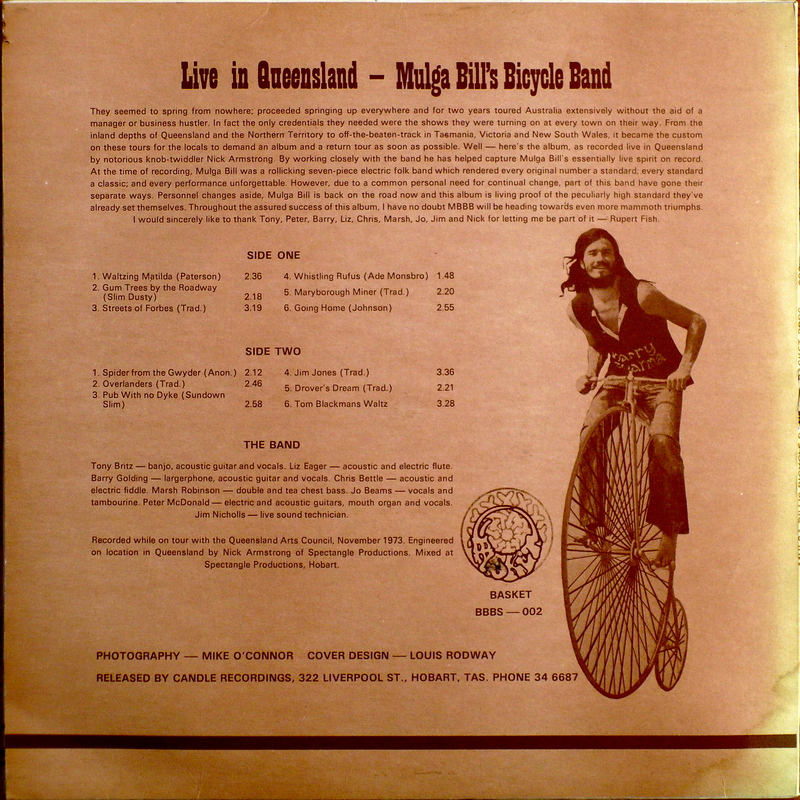 The first was an LP Mulga Bill’s Bicycle Band: In Concert Recording (Basket, BBBS 002, 1974) recorded mostly live on tour in Queensland in 1973. Tracks from the LP are available free for download by clicking the link on the bottom of this page. The second record, released in 1974 was an EP Rum and Raspberry: Mulga Bill’s Bicycle Band with four tracks (Clarion Studio, Melbourne recording, Stereo SF297B). Both records were paid for by the Band and were sold mainly at concerts across Australia between 1973 and 1975. There are many reviews from Australian newspapers for Mulga Bill’s Bicycle Band’s hundreds of concerts searchable amongst digitised newspapers on Trove (trove.nla.gov.au). Here is just one sample. Mulga Bill’s Bicycle Band, Queanbeyan School Hall, Saturday night. It had all the feeling of one of your “bushie” dances, this concert given by the Mulga Bill Bicycle Band. Kids slept on coats thrown across seats while more adventurous couples accepted the band’s invitation to get up and dance. Mulga Bill’s value is that the group sustains a tradition of music, of Australian bush music which was in danger of lapsing. The music is essentially simple — the beat rarely ranges from a strict two-to the-bar or a thumping three four_— and the lyrics trace the issues of concern to the bullocky and the drover-and the shearer. It is above all, participation music, even if that means just a handclap. Yet, in that simplicity, the group is deceptive. Much work has obviously gone into the balancing of the voices and instruments that make up Mulga Bill. In spite of the balance the two which stood out were the fiddle of Chris Bettle and the flute of Elizabeth Eager. The strangeness of finding a flute in a traditional Australian band was mellowed by the control and touch Miss Eager brought to the lacy background work which was her main concern. The problem, from a musical point of view, is that the simplicity occasionally reflects as simplisticity. The recitation of ‘Mulga Bill’s Bicycle’ was nothing more than an overplayed piece of hammish amateurism. Yet what can a critic say? The audience loved it all, from the exaggerated facial expressions to the sixth-form recitation. What Mulga Bill is all about (the band, that is) is communication. The bush melodies arc neatly patched together so as not to demand too much for a maximum response. It is joyful music and cannot be condemned for that. On the contrary, there is much to be said for a group which sets out, within a restricted framework, to do two things: to make people happy and to keep alive music which was fast becoming overgrown through disuse. This was not one of those concerts to approach cold bloodedly. The many who filled the back of the hall dancing kept the approach warm. Australian bush music comes, brashly but honestly, from its Irish, Scottish and English ancestry. It added not much of its own except a broad metre. Mulga Bill’s Bicycle Band showed itself the master of this idiom (they did the Australian version of ‘Black Velvet Band’), but exercised that mastery with a real sense of enjoyment. It is enough, I think, when your audience is totally captivated. Anything more ambitious this music is just not designed to do. Live in Concert LP recorded in 1973 available for download here.